Hi there! I'm new to the game. I only have the base game and the free dlc's. Question... I understand a little about how the game works but for the life of me, I can't seem to figure out what each tech will allow me to build/construct etc. For example... if I build a constructor with the intent of mining a resource, which tech will "open up" that option to construct a mining ring? Understand, that's just an example. I know I might not be explaining it very well but that's my issue. Simply put... how do I tell which tech will allow me to build/construct/access which item? I'm not an expert in this game (I prefer GalCiv 2), but I'm pretty sure you have everything you need to get started with starbase construction. No techs required. You can use the mining ring to get a mining operation started. Economy ring for economy boosts to planets, military ring for military boosts to ships, and culture ring for culture. You can also build a xeno archeology module for precursor relics and ascension crystals. 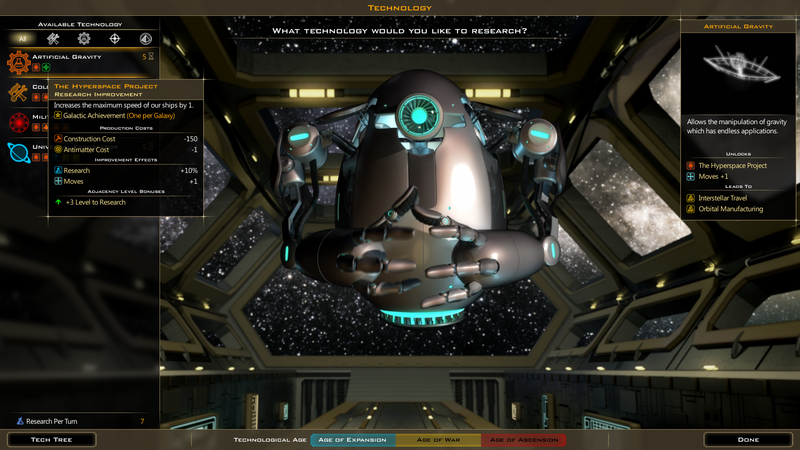 Techs will unlock more modules for your starbases. Starbase modules need a turn to be built, so don't expect everything to start working the moment you pick modules. They should take effect the very next turn. Which is my point... how can I tell which techs will unlock which modules? When I look at a tech I'm considering to research I can't tell WHAT it will unlock. Or am I missing something? Or am I looking in the wrong place? When you are looking at a tech there will be small icons under the name of the tech that show what is unlocked. Put your cursor on one of the icons to get a tool tip that gives you more information. If you click on a tech, the right side of the screen will also give you the information. You can put your cursor on the the icons there to get more information. Ah! Holy cow! why didn't I see that before! Thanks, Old-Spider! That is what I was looking for! Now I feel like a real dolt! DUH! While in the Research screen, another option is to click onto the "Tech Tree" in the bottom left corner of the screen. (See Old-Spider's pic above) That option works better for me personally, but it's whatever works best for you. I have another question... sorry guys... like I said... I'm new to the game. I can't seem to figure out WHEN I can build certain types of ships. For example, when I start a game I'm giving a survey ship and a scout ship. Now, when can I construct ANOTHER survey ship? When I click on the Shipyard I don't see the ship there to construct and again... I don't see in the tech tree what I should be researching in order to build another one. Apologies but this is very confusing. I can understand that I may not be able to build something right off the bat and that I'll have to research the needed tech to do it but I can't seem to find that as well. Ship hulls, ship mods, ship armor etc. It's not called that in the tech tree so I don't know what the hell I"m looking for in order to research it. Anyways welcome to the game it is fantastic and the DLC makes it absolutely brilliant. It is a lot to learn and a lot of the wikis seem outdated thankfully people on the forums are helpful. Ok the base game now comes with crusades. When he says base game he means crusades. In the shipyards there is a option to design ships. A shipyard is needed to design ships. You can build a shipyard on the planet, or you can use a constructor. Your first shipyard has to be built on the planet. Inside the shipyard I think the button is towards the bottom. Remember you have to sponser a shipyard. The maximum is five. In this game ship construction does not go to social construction if you don't use it, so you mysaehell sponser all your planets. The game has something called shipyard decay. How far the planet is away from the shipyard affects construction. The slynn start out twice the distance. The main thing here is that decay starts after 5 spaces between planet, and starbases any further, and you can't load your colony ships. Orbital construction is your first hull tech. Once you find the design ship in the shipyard then you look at your core ships. Is there one there you can use to design ship. If yes click on it the press the use design button in the bottom section. If you want to make the ship look better you can. If you can't find a suitable ship go to new design pick your hull first. Then you use the what I think the equip button to fill it right click to remove parts. Sorry I can't remember everything right now. On the back side not in front of my computer. The survey ship you start with is made with a medium hull. You don't start with the tech for it, so you can't build it. You will have to research Zero Gravity Construction to get medium hulls. There are several techs before it. You should go to the tech tree as PUREVENOM mentioned in Reply #5, then look in the Engineering section to see what needs to be researched. You don't need to do this to get a survey ship. At the beginning of the game you can build a ship called Guide that is a survey ship. You will need an Administrator to build it. It is weak and unarmed, so don't use it for anything dangerous. As the Admiral said, you can design your own ships at any time, but you will be limited by the techs you have researched. The survey ships the game designs after Zero Gravity Construction is researched aren't very good, so I have designed my own. I could have designed some before I could use medium hulls, but I waited so I could put enough weapons and defenses on them. I forgot to mention earlier that nearly everything has a tool tip associated with it. That is very important. You can learn a lot by putting your cursor on something (anything) and reading the tool tip. They are basically a manual. You should do this while in the tech tree to learn where things are. You can put your cursor on the name of a tech and on the icons that are below the name of the tech to learn a lot about them. Again, this works nearly everywhere because nearly everything has a tool tip associated with it. Try putting your cursor on things to see what you get. If you want a real manual to read, there is one available in the game directory. If you have installed steam and the game in the default locations, you can find it in this location: C:\Program Files (x86)\Steam\steamapps\common\Galactic Civilizations III. It will get less complicated and less confusing as you play the game more, so don't give up. Thanks for all your help guys. I really appreciate it! Guess I'll have to train my Civilization mind to read the tech tree more closely. In the Civ's they are a bit more specific and you can tell right away what tech will provide you what upgrade. It's hard to get used too but I'll manage. You've all been a great help!